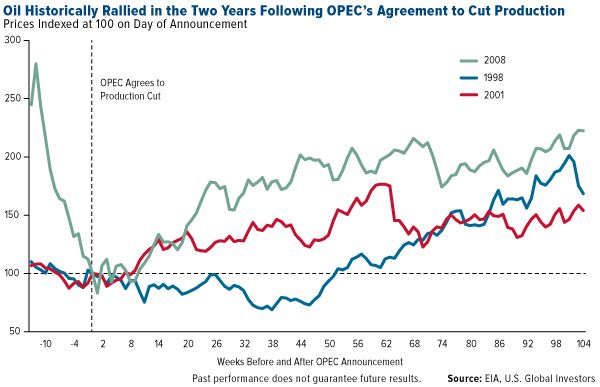 The 2017 battle for oil prices will hinge on OPEC cuts versus shale production. The Organization of the Petroleum Exporting Countries (OPEC) agreed on November 30 to cut output by 1.2 million bpd to 32.5 million bpd for the first six months of 2017, in addition to 558,000 bpd of cuts agreed to by independent producers such as Russia, Oman, and Mexico. After the announcement, the price of oil continued its bounce off the bottom. Many in OPEC, like Iranian oil minister Bijan Namdar Zanganeh, are confident in higher oil prices. The Iranian oil minister said, "I am certain that the OPEC and non-OPEC members will cut oil output as committed. This will remove the oil surplus from the market, balance the demand and supply, and lift prices." Well, that settles it. Case closed. If you can’t trust the Iranian oil minister, who can you trust? The OPEC announcement was on November 30, 2016. 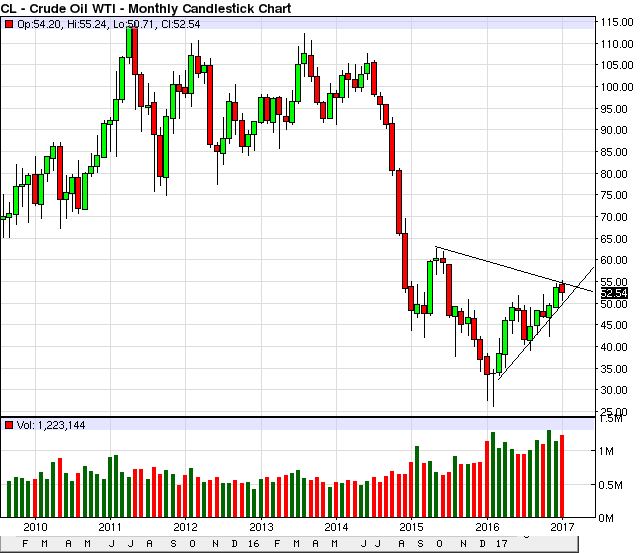 The oil price is up 15% since then, which would suggest that we have more upside. As I write this, Brent crude (global oil) is selling for $55.35, and WTI (U.S. oil) is selling for $52.23. Over the years, this price difference is narrowing. In the future, I expect it to be just about even. You see, there are several trends that will drive the price of oil higher; they will move WTI up to match Brent while at the same time pushing both prices higher. It is no secret that socialism always ends in food shortages and bankruptcy. In Venezuela, they have run out of other people's money. The country will go bankrupt in 2017. What you may not know is that Venezuela has 20% of the global oil reserves, and it sends its oil to the United States for refining. In 2016, it exported 2.15 million barrels a day. This, too, is dropping rapidly. The country can no longer pay wages, keep the lights on, or afford to pump. This oil will have to be replaced. Even though it isn't what it used to be, Venezuela’s oil production (2.2 mb/d) is considerable, and any stoppage will send prices higher. OPEC is Saudi Arabia, and Saudi Arabia is state-owned oil company Saudi Aramco. Saudi Aramco has proven reserves of 260 billion barrels — that's the largest, cheapest to produce, most easily refined sweet crude in the world. The Saudis are planning on a Saudi Aramco IPO in 2018 at an estimated market value between $1.25 trillion and $10 trillion. That's right; trillion with a "T." This would make it the biggest IPO in history and the largest company in the world. For comparison, Apple has a market value of $628 billion. Heck, total U.S. GDP is only $16.77 trillion. You can see why the Saudi leadership has reversed its strategy to drive down prices and gain market share. They now want to push prices higher, come hell or high water. Furthermore, the drive to cash in on Saudi Aramco in 2018 is the biggest driver of the country's oil manipulations. If it sold just 5% of the company at $100 billion, it would be four times as large as the next-biggest IPO in history, Alibaba (BABA). And of course, Wall Street wants in on this deal. Every banker in the world is pursing deals in The Kingdom right now. At the top of that list for bankers is getting a piece of the work involved with the Saudi Aramco IPO. Saudi Arabia has paid out $100 million to investment banks in fees during the first five months of the year, a 30 percent increase. The Saudi Aramco IPO alone should generate roughly $50 million in fees, but the opportunities don’t stop there. Beyond the potentially $2 trillion Saudi Aramco IPO, Saudi Arabia is looking at selling hundreds of state assets in a bid to bolster its finances, reduce its dependence on oil, and create a modern twenty-first century economy. These deals will require not only advisory services on sales and deal structuring, but the sale of potentially up to $15 billion in bonds. This means investment bankers like Goldman Sachs, HSBC, and JPMorgan Chase will push the oil price higher throughout 2017 to maximize their gains. Expect all sorts of positive oil price reports and CNBC interviews in the second half of 2017. This global push to cash in on the Saudi Aramco IPO is not reflected in the markets and would be hard to overstate. Obviously, the big winner in this move will be non-OPEC and non-Russian oil producers. This means the United States and Canada. That said, the lowest-cost producers are in the U.S., where costs have dropped in two main regions. Plus receive our monthly free report, "Two Stocks to Play The Coming U.S. Oil Export Surge". Daily commentary and advice from energy investment experts. Access to some of the best oil, gas, and cleantech stock picks around. Foresight on how the future of energy will unfold. The Permian Basin is the hot sector of low-cost shale production these days. It is big and deep. The Permian's hydrocarbon deposits cover an area about 250 miles wide and 300 miles long, a whopping 75,000 square miles, with oil and gas produced from depths of a few hundred feet to miles below the surface. The basin contains one of the world's thickest deposits of hydrocarbons. Permian-aged rocks come from an era 299 million to 251 million years ago, when the basin reached its maximum depth of 29,000 feet. And that thickness is what separates the Permian from everything else. In terms of the thickness of the hydrocarbon-producing zone, the Bakken Shale averages up to 130 feet in thickness, while Eagle Ford Shale formations are 150–300 feet thick. The Permian offers formations that are 1,300–1,800 feet, which is 12 times the Bakken's thickness. Within the Permian are three large sub-basins stacked with various reservoirs of limestone, sandstone, and shale. 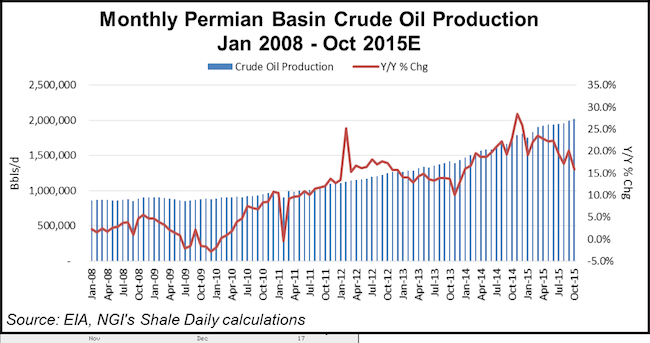 Back in 2014, there were about 200 oil producers in the Permian. It is hard to find reliable numbers after waves of bankruptcies, but rig counts can be used as a comparable. Oil rig counts went from 580 to a bottom of 125 and are now climbing over 200 again. As you can tell by this chart, even during the last two years when crude prices dropped, production in the Permian continued to grow, though at a slower rate. There are a number of companies that went public at the top of the market in 2014. These companies were flush with cash and able to buy up other high-quality assets from those who were hit with cash flow problems during the oil price rout. I’ve recommended one of these companies in my trading service Crisis and Opportunity, and I will recommend more over the next few weeks. Another way to profit is to buy the infrastructure plays — that is, those companies that supply rigs and services. They will benefit as U.S. production ramps up. These companies include Schlumberger (NYSE: SLB), Halliburton (NYSE: HAL), and Baker Hughes (NYSE: BHI). In support of this investment theory, I came across an article in the Albuquerque Biz Journal that said Halliburton is looking to hire about 200 workers for product service lines and support functions in the Permian Basin. In today's manipulated and Fed-driven investment world, you have to ride the bubbles because that is where the money is. This begs the question, what is the fad now?